A lurking predator – AMBUSH! Esox lucius or the Northern Pike is an aggressive feeder that likes to lie in wait staying very still for along period of time, and then striking with short bursts of rapid acceleration. This pike is quite different from some other predatory fish like the perch which chase down their prey. 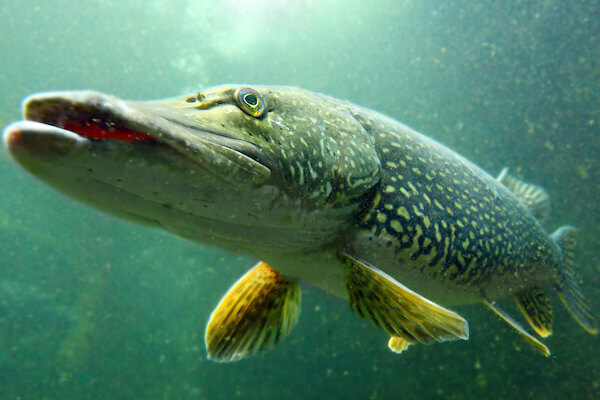 The swimming character of the Northern Pike has been prized by fisherman for its determination and bursts of high energy. The fish move in an S shape to accelerate, and in a kind of a C to slow down quickly. These fast start movements, which other fish usually use to escape, is used primarily to catch mostly lots of small fish primarily Yellow Perch, sunfishes, minnows and suckers. However, these large jawed fish will also consume frogs, crayfish, waterfowl, rodents and other small mammals. The fish is also a cannibal - known to eat its own, and particularly the young which some theorize is why the females lay so many eggs. The Pike eggs and new hatchlings have a high infant mortality rate - often falling prey to larger pike, perch, minnows, waterfowl, water mammals and even some insects. If the Northern Pike makes it to adulthood, its biggest worries are in the Great Lakes are the invasive sea lamphrey and humans. Spawning adults, in shallows, can be vulnerable to bears, dogs and other large carnivores. As part of the Pike family (Esocidae), Northern Pike are often mistaken for its usually larger cousin the Muskellunge, which does not have the light markings on a dark body and has fewer than six sensory pores on the underside of each side of the lower jaw. Mature Northern Pikes are olive green in colour with light bar like spots and few to many dark spots on the fins. They have with a white to yellow belly. Younger pikes have yellow stripes on a green body which divide into light spots as they grow while the green turns to olive. 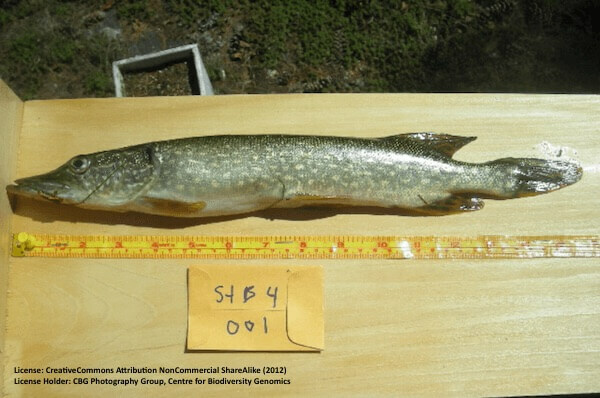 And how did the Esox lucius become commonly known as a Northern pike? Because it looks like the old Middle Ages weapon or long pole known as the Pike.